At the time, it was Chicago’s first playoff victory since the 1994 season. 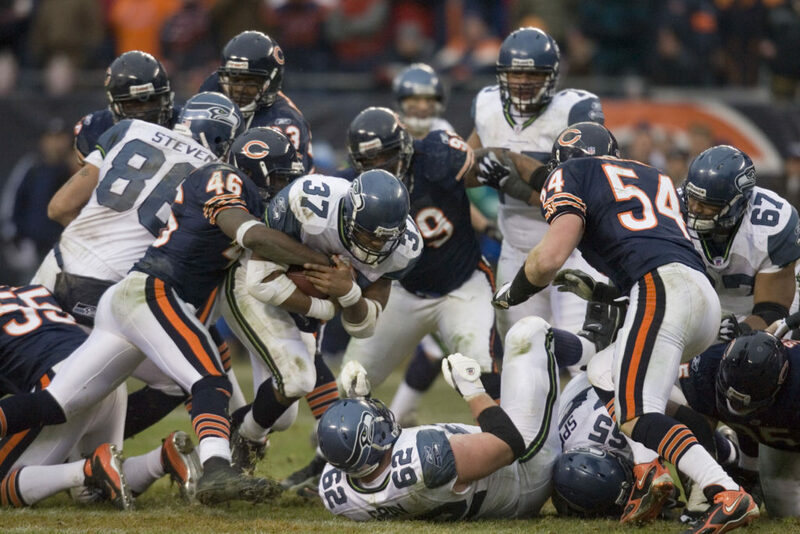 The Bears owned the first half, but Shaun Alexander and the Seahawks scored 10 points in the third quarter to take a three-point lead. However, Chicago’s Robbie Gould tied it late in the fourth with a 41-yard field goal and won it in overtime from 49 yards out. Talk about wild. The Packers and Cardinals combined for more than 1,000 total yards while Kurt Warner and Aaron Rodgers threw nine touchdown passes between them. Three players had at least 125 receiving yards. 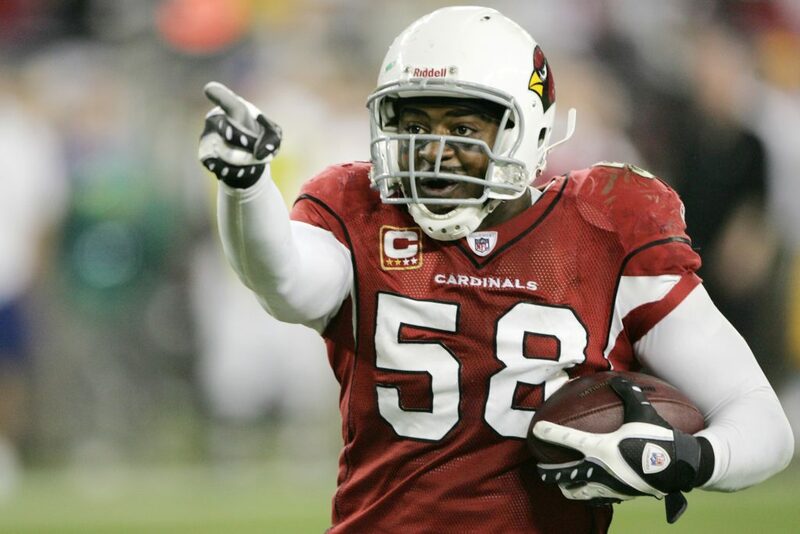 Yet, in a strange twist, the highest-scoring playoff game in NFL history ended when Karlos Dansby returned a Rodgers’ fumble 17 yards for a touchdown in overtime. 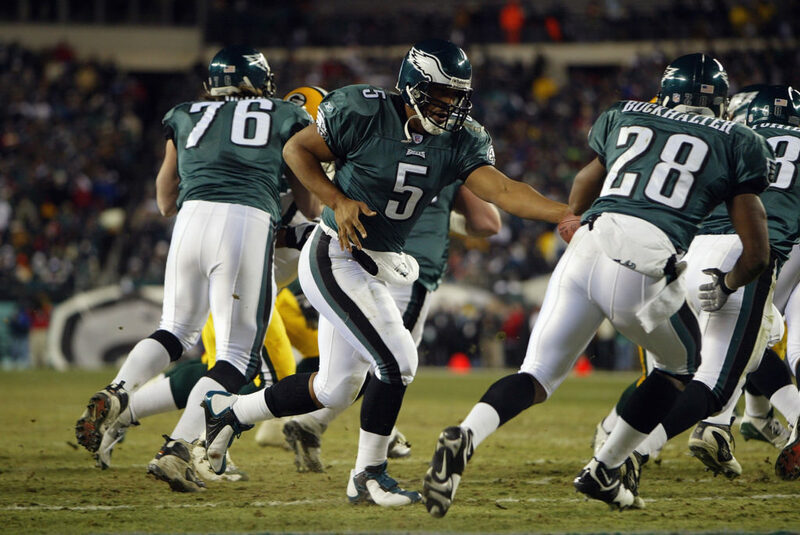 This was perhaps Donovan McNabb’s finest moment in the NFL. The Eagles trailed 14-0, but McNabb brought them back while throwing two touchdowns and rushing for 107 yards. His highlight came with just over a minute left in regulation when he connected with Freddie Mitchell to convert an improbable 4th-and-26 to set up an overtime-forcing field goal by David Akers. Akers would go on to win the game from 31 yards in the extra session. 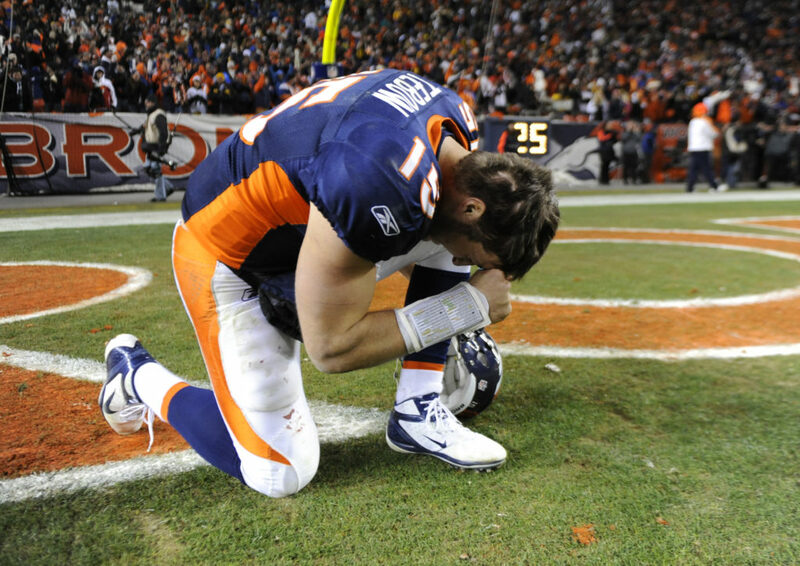 Tim Tebow’s lone playoff victory will forever live in Broncos lore. Lost in the outcome and Tebow’s one shining moment, was Pittsburgh rallying from 20-6 down at half to force overtime. But Tebow was the story — throwing for 316 yards with two touchdowns, the second to Demaryius Thomas for an 80-yard strike on the first play of overtime. In stunning fashion, the 7-9 division-winning Seahawks became the first team with a losing record to win a playoff game. 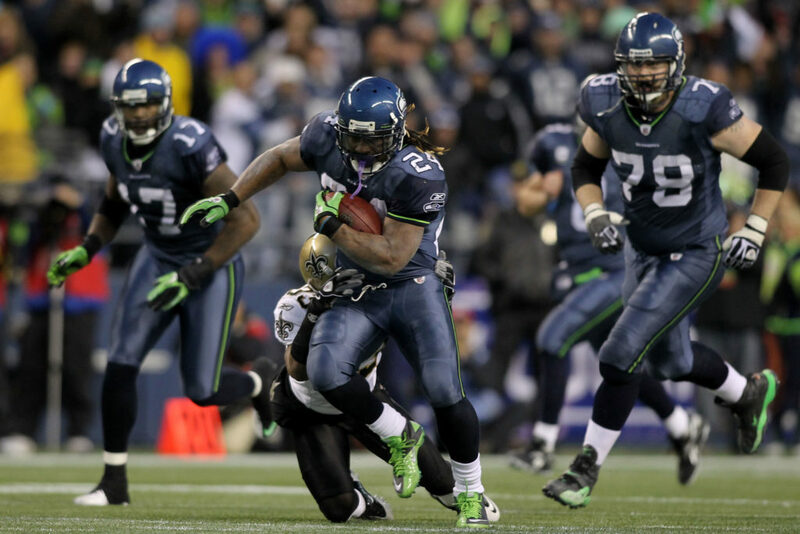 The defending Super Bowl champion Saints led 10-0, but Marshawn Lynch and Seattle roared back. Lynch ran for 131 yards on 19 carries and essentially iced the game with a 67-yard touchdown burst late in the fourth quarter. Peyton Manning would finally raise the Lombardi Trophy the next season, but this might have been his most disappointing playoff defeat. 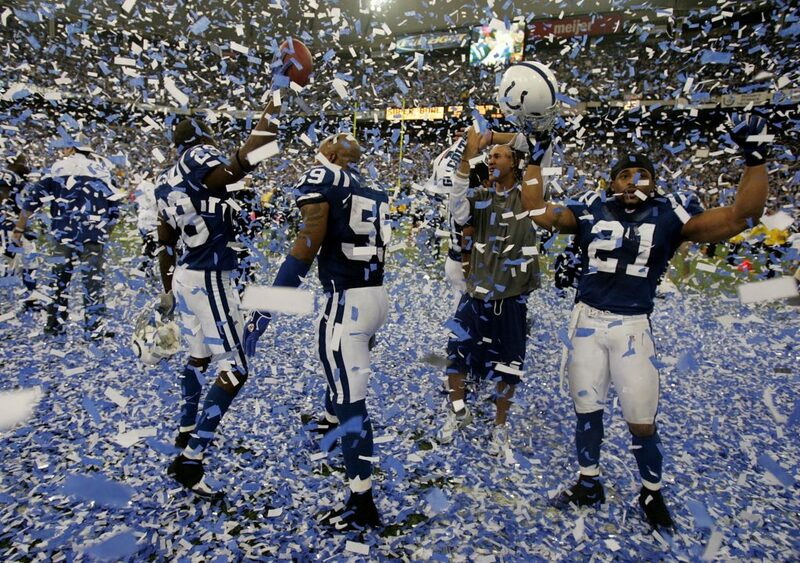 The Colts won their first 13 games of the 2005 season and were heavy favorites in this one. However, Ben Roethlisberger and the Steelers came out with a purpose. Pittsburgh raced out to an early 14-0 lead and held a 21-3 advantage after three quarters. Pittsburgh became the first No. 6 seed (since the inception of the 12-team playoff format) to beat a No. 1 after Mike Vanderjagt missed a tying 46-yard field goal. In their second season of existence, the Jaguars reached the AFC Championship Game. After rallying to win at Buffalo in the Wild Card round, the Jags fell behind 12-0. 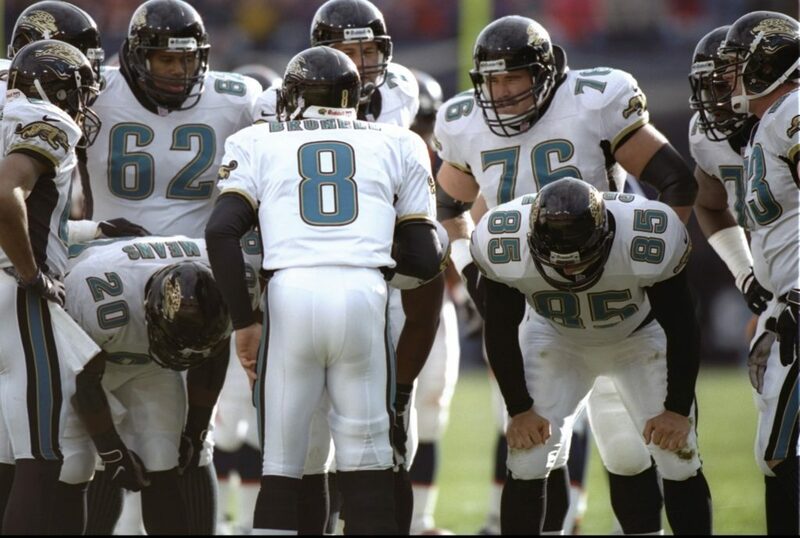 However, Mark Brunell and Co. scored the next 23 points and survived a back-and-forth fourth quarter to pull off the postseason shocker. In one of the more controversial games in NFL history, the Cowboys’ stellar 12-4 season ended via video replay. 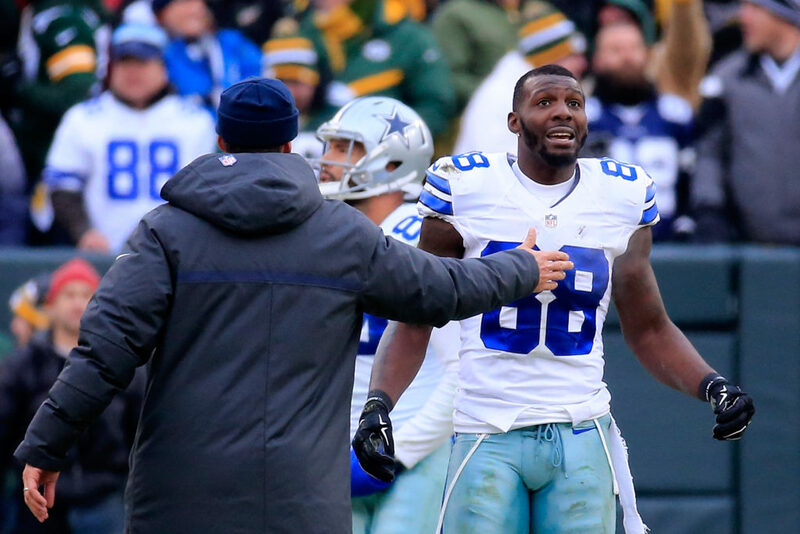 With the Cowboys trailing by five, Dez Bryant appeared to have made a remarkable catch on 4th-and-2 near the Green Bay goal line late in the game. However, Bryant lost control while reaching for the end zone, the Packers challenged, the call was reversed and the Lambeau Field crowd left happy. The league would later say Bryant made a clean catch and the call should not have been reversed. The “Fog Bowl.” In one of the most memorable playoff games in league history, a dense fog rolled in on an unseasonably warm New Year’s Eve day along Chicago’s lakefront and hindered both teams’ visibility. 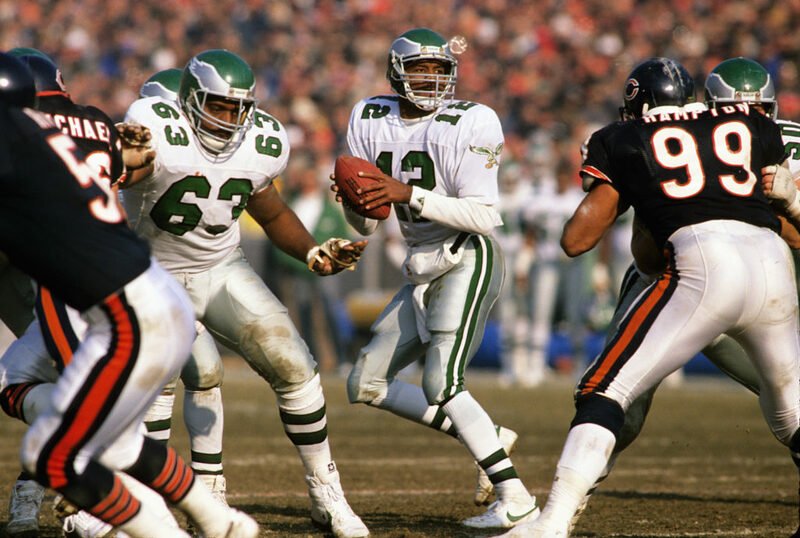 The Eagles’ Randall Cunningham threw for 407 yards but was picked off three times as his team managed just four Luis Zendejas field goals. With the wind chill below freezing, a trip to the Super Bowl would be decided on the frozen tundra of Lambeau Field. The Giants went up 6-0, but the game was tight throughout as the visitors never intended to go away. 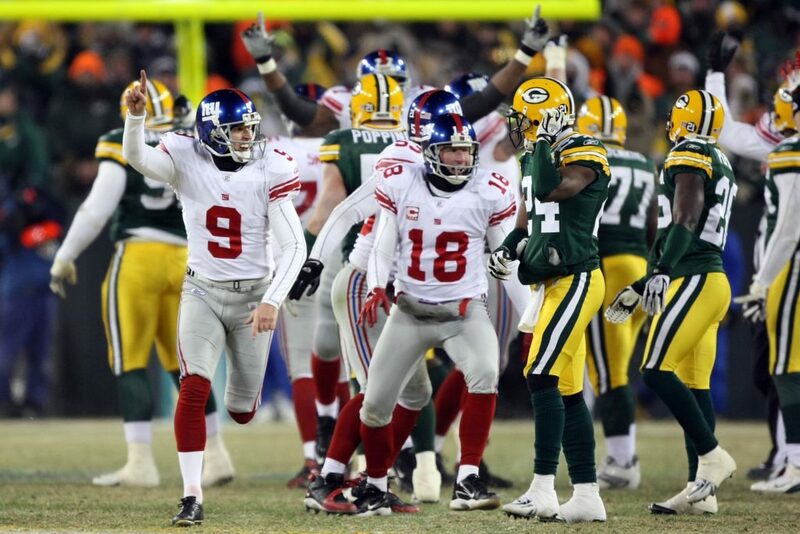 Exactly 17 years to the day that Matt Bahr made a field goal as time expired to send New York to the Super Bowl, Lawrence Tynes did the same in overtime. Days prior to the game, a St. Louis newspaper was already providing details for a Super Bowl parade and championship gear. In the end, it was the Patriots who celebrated their first Super Bowl title. New England led 17-3 after three quarters, but the Rams tied it following Ricky Proehl’s 26-yard touchdown catch with 1:30 left. But Tom Brady’s legacy truly began when he marched the Pats 53 yards in nine plays to set up Adam Vinatieri for the 48-yard winner as time expired. 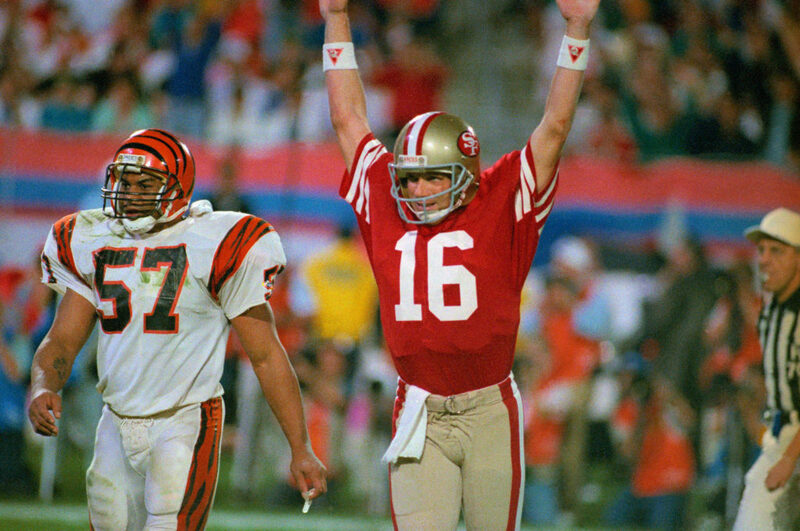 The 49ers’ second Super Bowl win over the Bengals came in dramatic fashion and further secured Joe Montana’s legacy as one of the great big-game quarterbacks. Tight throughout, Cincinnati went ahead 16-13 with 3:20 to play. Starting from his own 8-yard line, Montana marched the Niners down the field on 11 plays and concluded the Super Bowl-winning drive with a 10-yard TD pass to John Taylor with 34 seconds remaining. In one of the longest games in NFL history, the Panthers stunned the favored Rams, who had won 14-straight home games, in double OT. Field goals dominated the first three quarters of the game. Fittingly, St. Louis kicker Jeff Wilkins converted his fifth of the day to force overtime. However, Carolina’s Jake Delhomme connected with Steve Smith for a 69-yard game-winning pass play on 3rd-and-14 in the second overtime. 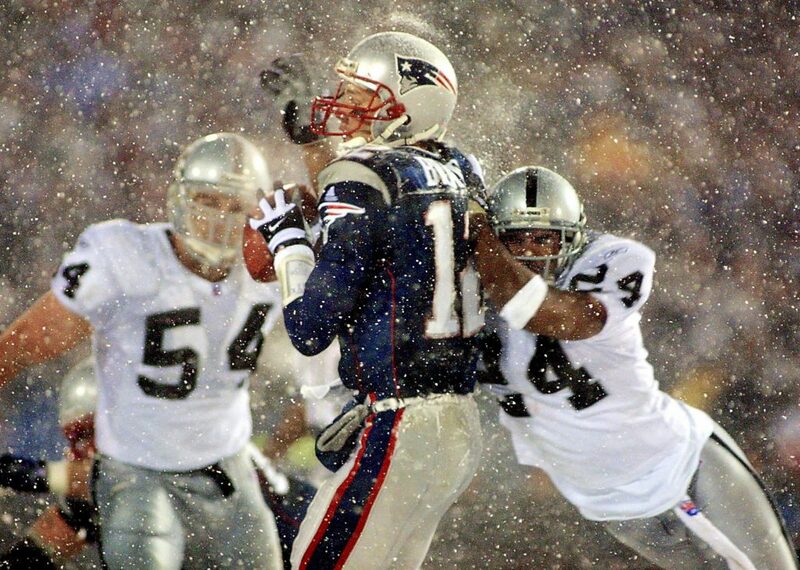 The last game at Foxboro Stadium was both memorable for the weather and the infamous “tuck rule.” Late in the game, on a snow-covered field, Tom Brady appeared to fumble. Oakland recovered with a chance to then ice – pun intended – the game. However, after a review, officials overturned the call saying Brady attempted to “tuck” the ball after stopping his passing motion. 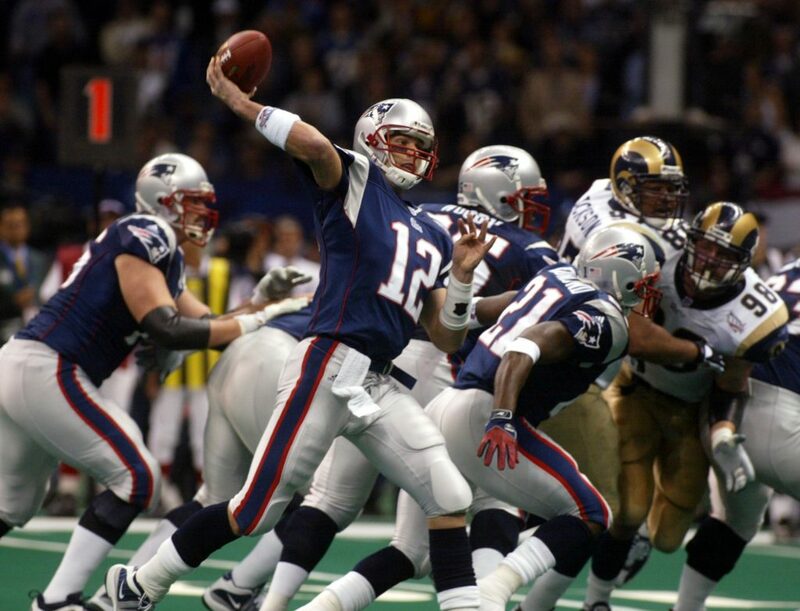 New England kept possession, and would eventually force overtime with a field goal and win the game in overtime. This was to be the Vikings year. They went 15-1 in the regular season and rolled past Arizona in the divisional round. Don’t forget, though, Atlanta was just as dominant at 14-2 and unfazed after falling behind 20-7 in this contest. 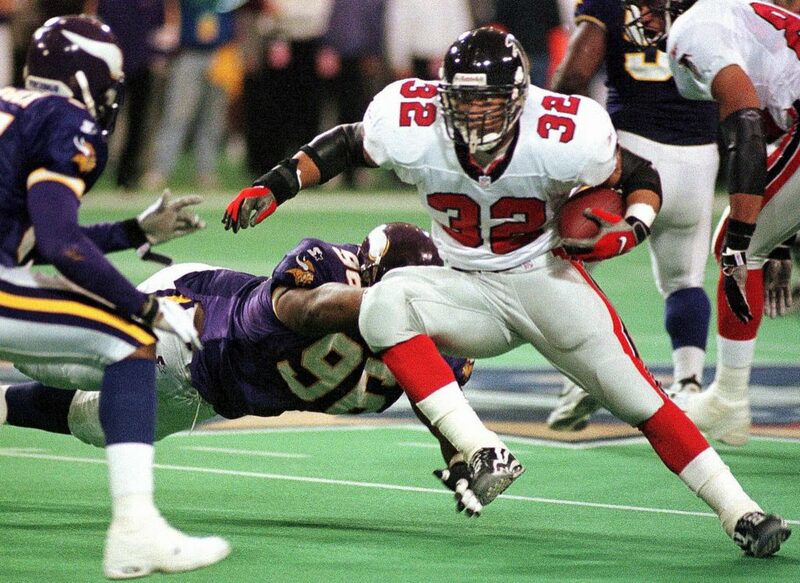 The Dirty Birds scored 10 unanswered points to force overtime and Morten Anderson silenced the Metrodome crowd with his 38-yard winner. 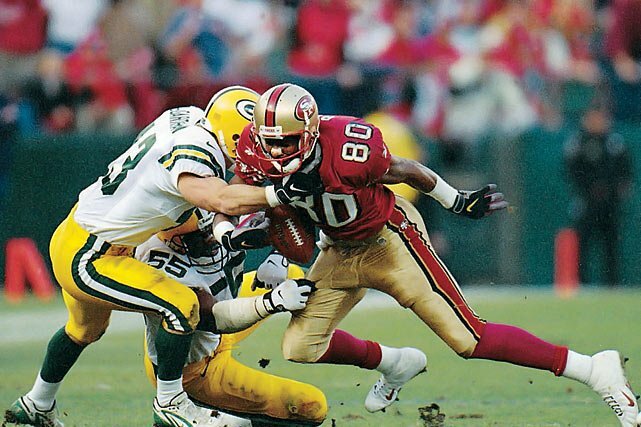 Green Bay had eliminated San Francisco from the playoffs each of the previous three seasons. It looked as if that trend would continue after the Packers went up 27-23 with 1:56 left in the back-and-forth contest. 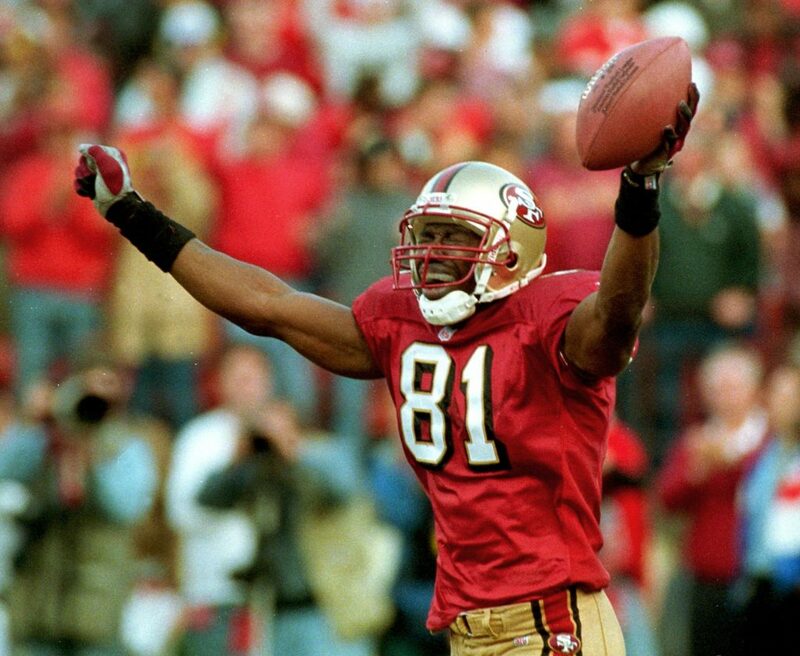 However, in the spirit of Joe Montana and Dwight Clark, Steve Young found Terrell Owens in the end zone from 25 yards out with three seconds left — the 49ers had finally exorcised their Packer playoff demons. Entering this season, the Chiefs had one victory in their previous 12 playoff games. This might be the one loss that stings the most. Alex Smith threw four touchdown passes and Kansas City led 38-10 early in the second half. 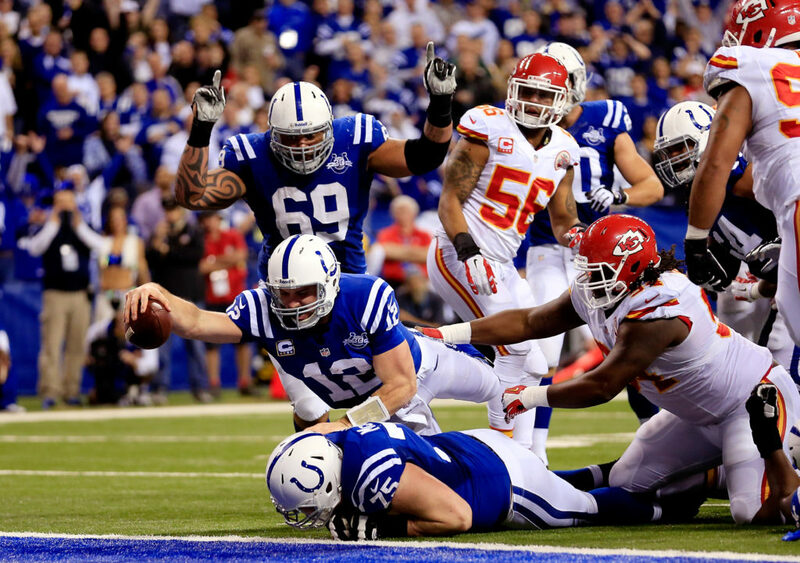 The Chiefs, though, would never reach the end zone again as Andrew Luck and the Colts erased the 28-point deficit to complete the second-largest comeback in NFL playoff history. 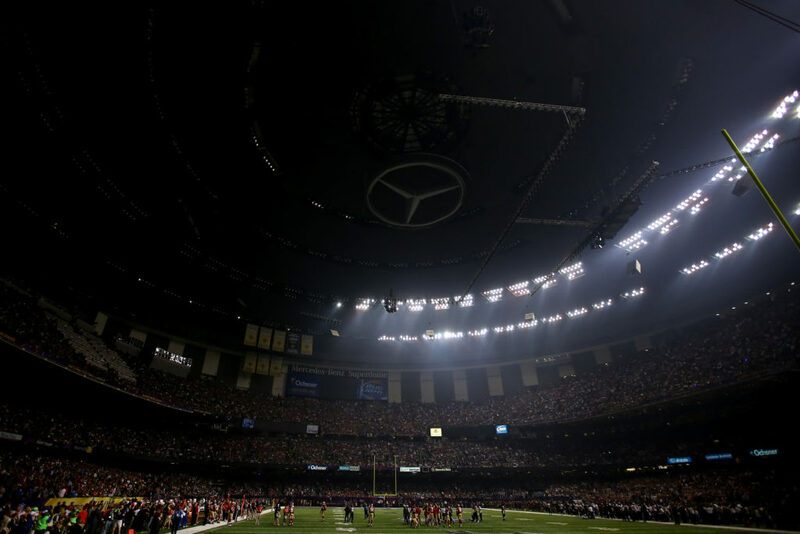 The pregame hype was dominated by the Harbaugh brothers facing each other, but it wound up being remembered mostly for a third-quarter power outage at New Orleans’ Superdome that delayed the game 34 minutes. The Ravens led 28-6 at the time, but when the lights came back on the 49ers scored the next 17 points to make things interesting. A pair of Justin Tucker fourth-quarter field goals helped Baltimore stay ahead and claim their second Super Bowl. Green Bay dominated the first half in Seattle. The Packers parlayed a 16-0 halftime lead into a 19-7 advantage with less than three minutes to play. 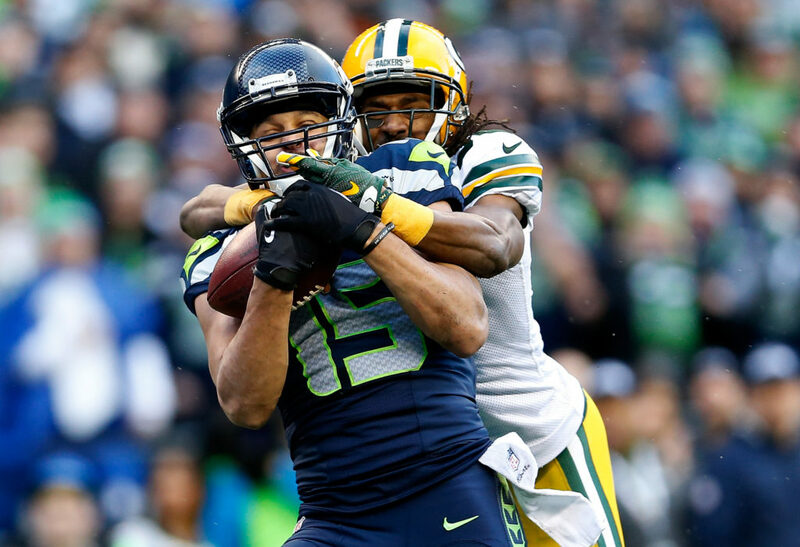 Despite four interceptions by Russell Wilson, the Seahawks scored 15 fourth-quarter points — thanks in part to a timely onside kick — to take the lead late before the Packers forced overtime. In the extra session, Wilson hit Jermaine Kearse with a 35-yard TD pass to complete what early on looked like an improbable victory. The “Mile High Miracle” — one Denver fans hardly find miraculous — was wild from the get-go. Tied at 14-14 after the first quarter, the contest featured punt and kick returns for touchdowns by Denver’s Trindon Holliday and an interception taken back for a score by the Ravens. 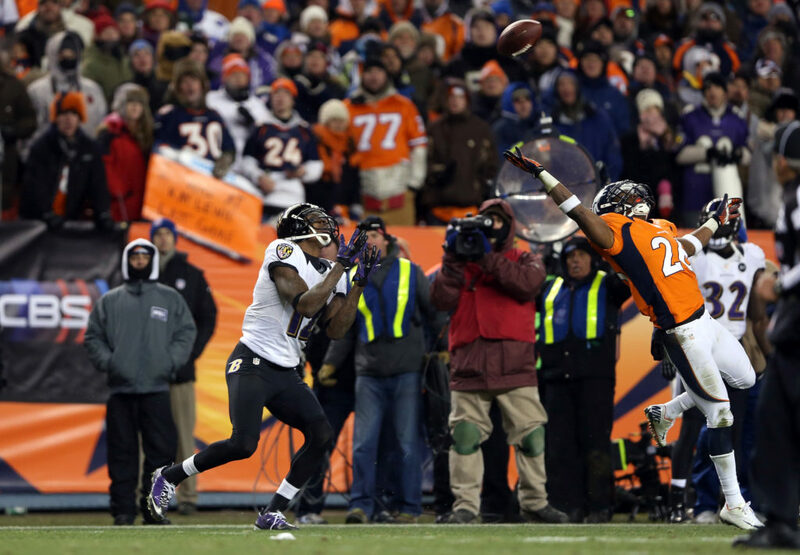 However, the game’s highlight came with 41 seconds left in regulation when Jacoby Jones got behind the Denver secondary for a 70-yard TD reception that ultimately forced overtime. After years of failure — including two losses to New England over the previous three postseasons — Peyton Manning finally punched his ticket to the Super Bowl. Indianapolis overcame a 21-6 halftime deficit by scoring 32 second-half points to turn the tables on a Patriots team that looked gassed during the final two quarters. Manning threw for 349 yards and one touchdown in addition to running for a score. To the folks in the great state of the Minnesota, it’s become known as the “Minneapolis Miracle.” After entering the fourth with the score 17-7 in favor of the Saints, the two teams combined to score 29 points in the final 15 minutes. The last six came as time expired when Case Keenum threw a strike to Stefon Diggs. 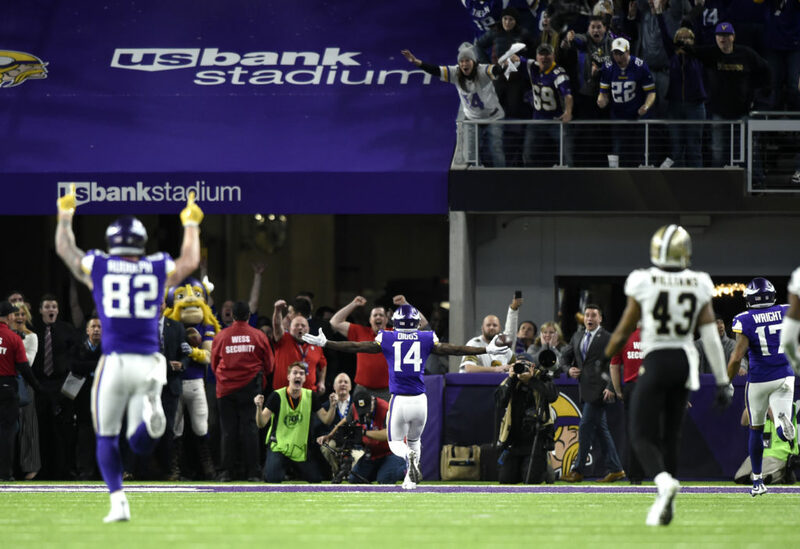 New Orleans’ Marcus Williams made a grave error trying to make the tackle, allowing Diggs to storm toward the end zone for an improbable 61-yard game-winning TD. The Patriots’ most recent Super Bowl title came via the greatest comeback in the title game’s history. 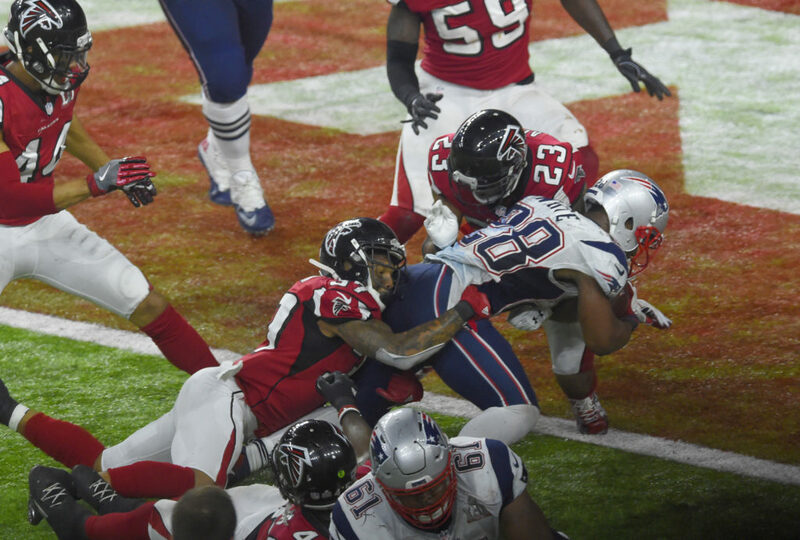 Trailing 28-3 after being dominated by the Falcons for almost 2 ½ quarters, New England, led by a revived Tom Brady, found its game and came all the way back to stun Atlanta and win the first Super Bowl decided in overtime. With a 20-7 lead and less than eight minutes to play, it looked as if the Steelers would cruise to their record-sixth Super Bowl title. The Cardinals, however, would not go quietly. Led by Kurt Warner and Larry Fitzgerald, Arizona scored 16-straight points to lead 23-20 with less than 2 ½ minutes to go. However, Big Ben and the Steelers had one push left and drove 78 yards in eight plays, capping the winning drive with Santonio Holmes’ memorable 6-yard TD catch with 35 seconds remaining. The overall performance wasn’t pretty, but the Giants’ resiliency helped them stun the heavily favored Patriots — who were looking to join the 1972 Miami Dolphins as the only teams to go undefeated throughout a season. Eli Manning led New York on a 12-play, 83-yard drive — highlighted by David Tyree’s remarkable one-handed catch against his helmet — that ended with Plaxico Burress’ 13-yard touchdown reception with 35 seconds to play. From an excitement level, this one is hard to beat. All the scoring came in the second and fourth quarters. The Patriots led 21-10 early in the fourth, but Carolina scored the next two touchdowns to take a one-point lead. Tom Brady and Jake Delhomme each threw for more than 300 yards and three touchdowns, but Adam Vinatieri again came through with the tie-breaking field goal with four seconds left. 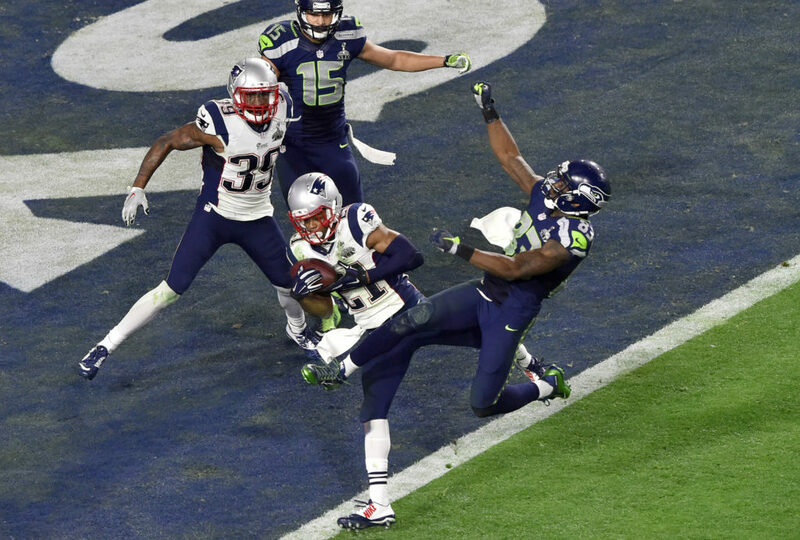 The Seahawks’ bid for back-to-back Super Bowl victories ended when New England’s Malcolm Butler intercepted Russell Wilson’s pass at the goal line on 2nd-and-goal with 26 seconds left. Pete Carroll’s decision to pass instead of giving the ball to Marshawn Lynch, who rushed for 102 yards, will be forever questioned. One yard, one little yard, kept the Titans from winning their first Super Bowl. While Tennessee valiantly fought back from a 16-0 hole to tie the game, the finish still haunts fans of the team. 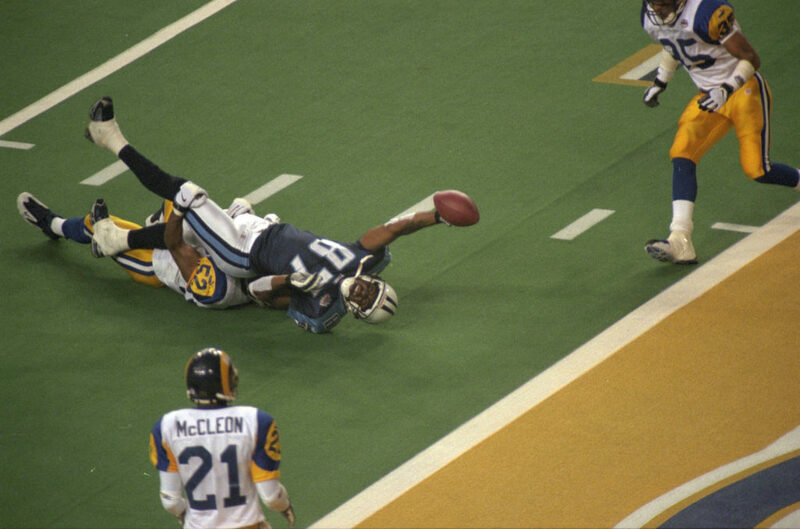 Trailing by seven at the Rams’ 10-yard line, Steve McNair hit an in-stride Kevin Dyson angling for the end zone, but St. Louis’ Mike Jones stopped him a yard short as time expired. 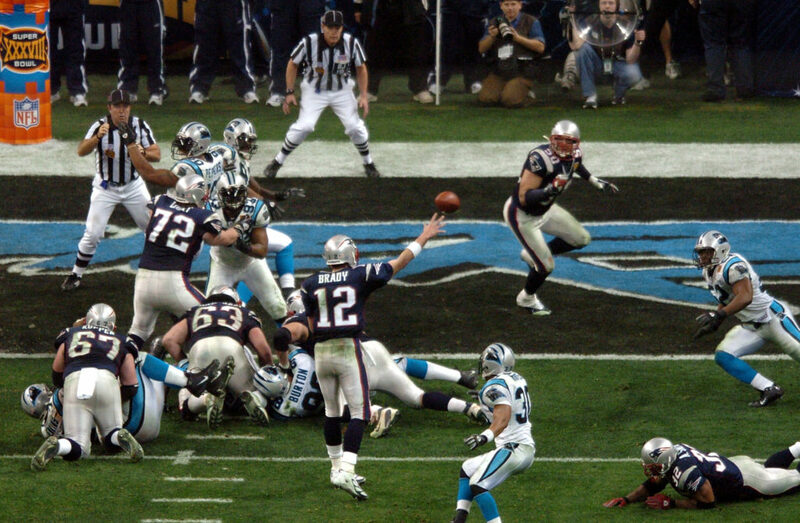 It remains the most memorable finish in Super Bowl history. Simply known as “The Comeback,” Buffalo completed what is still the largest come-from-behind victory in NFL playoff history. 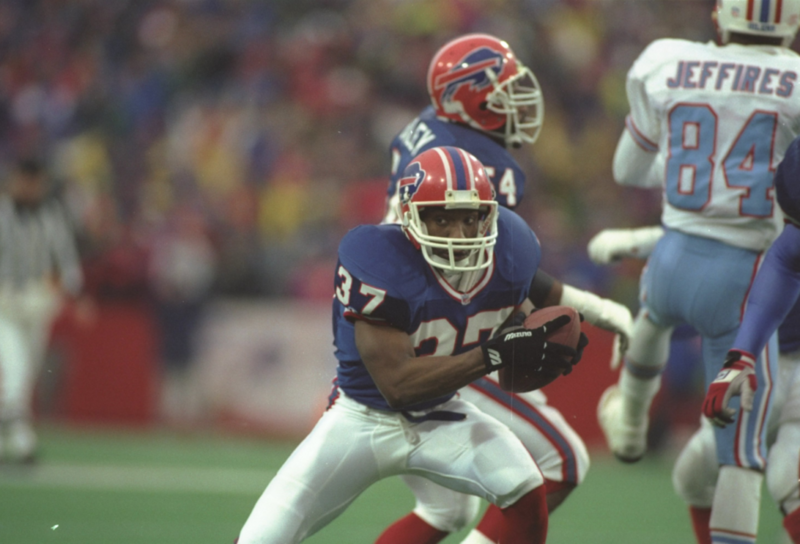 With backup quarterback Frank Reich at the helm, the Bills overcame a 35-3 deficit early in the third quarter. After surrendering the lead, the Oilers regrouped to force overtime with an Al Del Greco field goal. In the end, Steve Christie came through from 32 yards out and the improbable comeback was official. 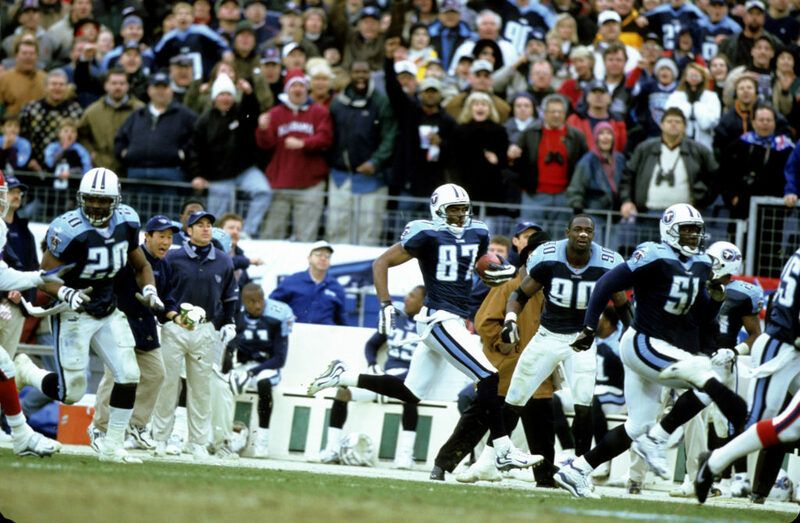 The “Music City Miracle” is still the most improbable finish in NFL playoff history. All the excitement came during a 19-point fourth quarter, capped off with the craziest kick return since the Stanford band debacle. Buffalo led 16-15 with 16 seconds left. On the ensuing kickoff, Tennessee’s Frank Wycheck, who got the ball from Lorenzo Neal, tossed a designed lateral across the field to Kevin Dyson. Dyson darted 75 yards down the sideline to complete the unthinkable game-winning return.